This is a link, but I'm supporting Puffy Paws in Florida. I hope you will consider this special shelter too! Noted and voted!! Gave some more food while I was there too! Thanks Nancy!! thank you, nancy!! we are in 10th place right now in florida and we've never been that high up before. you can vote every day. Noted and Voted Tks Nancy.. Noted & voted. My vote goes to Dallas/Ft.Worth Pug Rescue (DFW Pug Rescue on Petfinder) every year. They have kept me supplied with blind pugs, pug cancer patients, and diabetic pugs for years. I can't resist adopting an "unadoptable". Their motto: No pug left behind. Thank you Nancy ~ Voted for Puffy Paws! Hugs and Hello dear Catherine! Catherine, will save and vote each day for Puffy Paws only because you work so hard for them as well as some of my other friends here on Care2. There are shelters her in California that if it wasn't for you I would vote for them, but all Shelters need this Money IMO! Don't Breed, get your best friend from a SHELTER! thanks marilyn. i can't star you yet. you can still help the cali shelters. just throw in a vote now and then for puffy paws. puffy paws is usually struggling, so that's why i vote for them. but, if i read about a shelter that's about to close, i always switch to them temporarily. in fact, i just made five bracelets for pennies4paws to auction in order to save dodge county humane society in wisconsin. they absolutely will be shutting down if they can't turn things around quickly. 3rd shelter closing i've read about in just one week. voted for puffy paws. They deserve the money. Any money available for animal rescue work is good news. 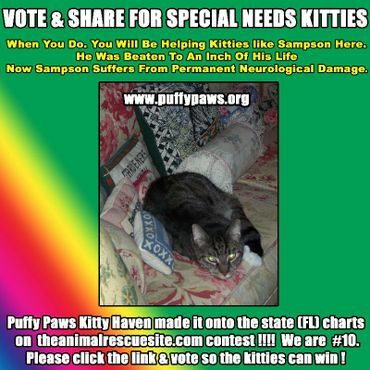 Voted again for Puffy Paws - thanks for reminding us we can vote every day, Catharine T! I am blessed that the rescue i foster for will never be in dire straits, so Puffy Paws it is. I hope this will help them as i know the few small donations i have been able to make to them don't add but a drop in the bucket. it's usually those little drops that save puffy paws on a daily basis.